If you are looking for a low sugar, low calorie snack, this is not it. On the other hand, if you want to get type two diabetes, this will help you on your way. A former roommate introduced me to Mississippi mud. 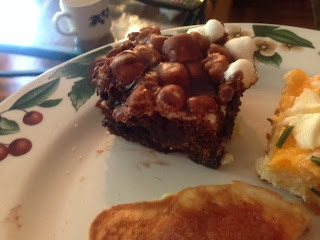 What's not to love about brownies smothered with gooey marshmallows and rich chocolate icing? 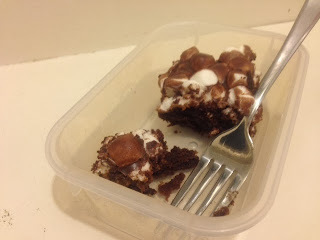 I have seen a few blog posts and recipes for chocolate chip cookie brownies, and I thought it would be ingenious to join these two extravagant desserts together. It is common knowledge that there is strength in unity. In these pictures it is hard to see the chocolate chip cookie layer, but it's there. Trust me. That last sentence looks so ominous. This recipe is versatile. The top picture shows that it works well as a side dish for brunch. Maybe? The following photo demonstrates its ability to work well as a glutinous snack eaten directly from the Tupperware. This recipe combines a chocolate chip cookie recipe and a Mississippi mud recipe. The ingredients are ½ cup butter, 1 cup brown sugar, 1 egg, 1 teaspoon vanilla, ½ teaspoon baking soda, 1 teaspoon warm water, ¼ teaspoon salt, ½ cup whole wheat flour, 1 cup all purpose flour, 1 cup semi sweet chocolate chips, one family size (13 by 9 inch) brownie mix, ¼ cup water, 2/3 cup vegetable oil, 2 eggs, 4 cups mini marshmallows, ¼ cup butter, 1/3 cup coco powder, 3 cups confectioners sugar, 1 teaspoon vanilla, and ½ cup milk. I began by making the cookie dough. I beat ½ cup butter and the brown sugar well. I then added the egg and vanilla and mixed. In a small bowl I combined the baking soda and warm water. The warm water came from the tap. I mixed these ingredients together. I added the baking soda mixture and salt to the creamed butter mixture and combined all the ingredients thoroughly. I then added the flour and stirred. I set this aside while I made the brownies after adding in the chocolate chips. This picture is so out of focus it's hard to tell if those are chocolate chips or beetles. In another large bowl I added the family size brownie mix and the requested ingredients. In my case, the box required ¼ cup water, vegetable oil, and two eggs. I mixed all the brownie ingredients together. I poured the brownie batter into a greased 9 by 13 inch baking pan. I doted the top of the brownies with globs of cookie dough. I sampled the cookie dough pretty well, but I added all the remaining cookie dough to the top of the brownie batter. I baked the chocolate chip cookie brownies at 350 degrees Fahrenheit for 35 minutes. While the cookies were baking, I prepared the frosting. I combined the ¼ cup of butter coco powder, confectioners sugar, teaspoon of vanilla, and milk into a bowl. I stirred the frosting until it small smooth and lump free. This wasn’t difficult because my butter was room temperature. I added the 4 cups of mini marshmallows on top of the cookies and baked for an additional 30 seconds. I wanted the marshmallows to expand and melt a little. After the marshmallows had melted a little, I poured the icing immediately on top. How could this not be incredibly tasty? It was dense, rich, and chocolaty. I ate several of these little gems. I let them cool a bit before digging in in order to let the icing set. I was a little surprised how understated the chocolate chip cookie bits were. You could taste the chocolate chip cookie chunks, but everything else was so rich. This would be good to eat on a rainy Saturday while reading a good book.